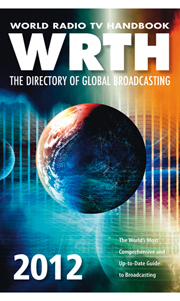 The World Radio TV Handbook (WRTH) A12 schedules updates file is now available to download, free of charge, from the WRTH website. This is a comprehensive update and supplement to the printed 2012 WRTH. The WRTH Editorial team is pleased to announce that the Summer/’A’ season broadcasting schedules file is now available to download, free of charge, from the WRTH website – click on http://www.wrth.com/ and follow the link “Latest PDF Updates”. Please feel free to pass this information on so that we may reach as many SWL’s, DX-er’s and professionals as possible. For contact details, transmitter sites and much more, please refer to the printed WRTH, which is available to order from the website. We hope you find this a useful accompaniment to the printed WRTH. On behalf of the publisher and editorial team at WRTH, happy listening! This entry was posted in Books, Broadcasters, Schedules, Schedules and Frequencies and tagged A12 Shortwave Schedules, Shortwave Radio, Shortwave Radio Schedules, WRTH 2012, WRTH 2012 Updates on May 10, 2012 by Thomas. The World Radio TV Handbook (WRTH) B11 schedules updates file is now available to download, free of charge, from the WRTH website. This is a comprehensive update and supplement to the printed 2012 WRTH. This entry was posted in Books, Broadcasters, Schedules, Schedules and Frequencies and tagged B11 Shortwave Schedules, Shortwave Radio, Shortwave Radio Schedules, WRTH 2012, WRTH 2012 Updates on February 1, 2012 by Thomas.